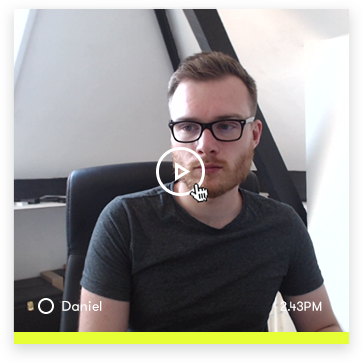 Sneek lets you see your team mates all day and start instant video chats with a single click. Try it free for 30 days. See all your team mates pretty faces on one screen as Sneek takes your photo at a regular interval (which you control). Yes, we all pick our noses, there's no shame. 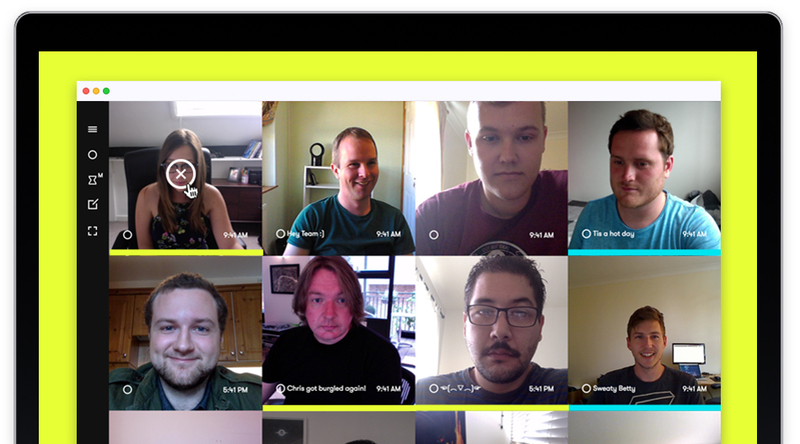 Click on your team mates lovely face to start an instant video chat in chat head or full screen mode, no waiting. Click on your own face to hang up. Click on additional faces to add others for a group chat. Each call group has a different colour. Click on your own face to leave the group. The others remain chatting and will probably talk behind your back, don't take it personally. Available means you’re free to chat if someone needs you. Busy mode means you’re pretending to be busy so other users have to hit you up to see if you’re free to chat. And away, well that obviously means you’re in the toilet. 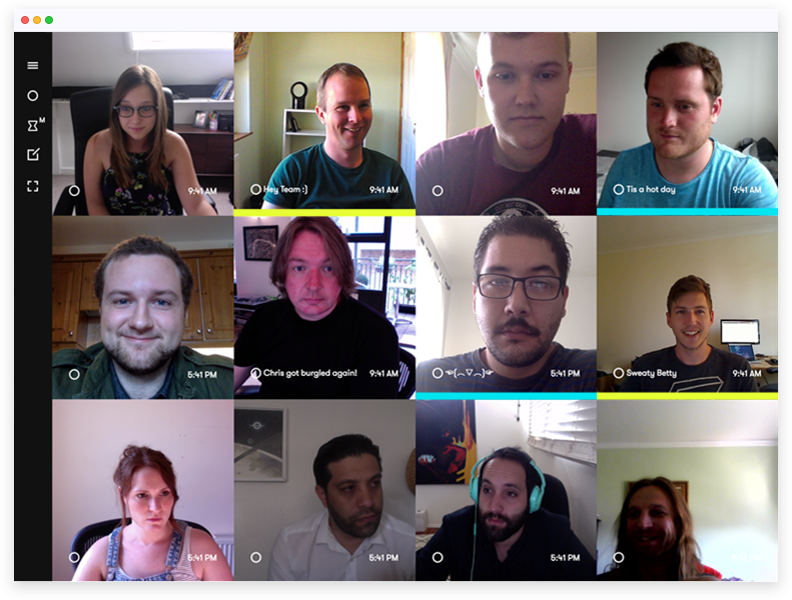 Sign in with Slack and add it to your team to start video chats direct from any Slack channel with "/sneek". Type "/sneeksnap @username" to send a photo of your team mate picking their nose direct to any Slack channel. 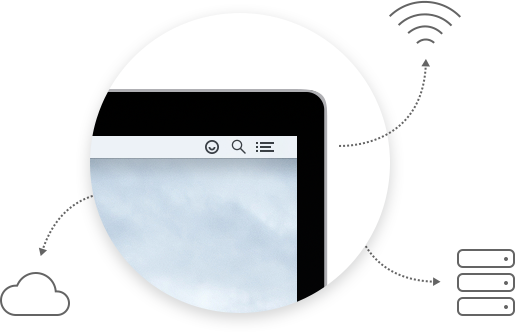 The team behind Sneek is very experienced in building highly scalable infrastructures. We're daily Sneek users ourselves, so we want the best performance we can achieve and promise you'll be impressed with the call quality and application performance. This of course, is assuming you aren't on dial up or in a hipster coffee shop sharing a 2mb connection with 40 other bearded men. Then we can't help you. Try Sneek Pro for 30 days free. There's no credit card required and no downgrade messing, after 30 days you'll automatically be switched to the free plan. If you love us, and we think you will, just add your payment details at any time to keep using Pro.